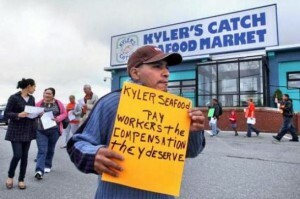 On May 4th of this year, Kyler Seafoods, located in New Bedford, MA, dismissed 52 employees as a result of an audit of the company carried out by US Immigration and Customs Enforcement. Many of those fired had worked for the company for over a decade. Despite their years of service, the employees were offered no severance pay and were not given the vacation pay that many of them had accumulated during their employment. In addition, the employees were given only three days notice of their termination, despite requirements under Massachusetts Law that employers must provide 90 days notice to employees in cases of mass firings. The majority of the fired employees are indigenous K’iche Mayans from Guatemala. The United States’ current immigration policy, which led to their firing, criminalizes immigrant workers and obscures the important contribution that these workers make to economies such as that of New Bedford. In addition, it ignores the many factors which propel forced migration of indigenous Guatemalans to the United States, such as discrimination, marginalization and human rights abuses in their home country. The UN Historical Clarification Commission in Guatemala documented acts of genocide committed against the K’iche people by successive Guatemalan military dictatorships, many of which were heavily supported by the US. The affected K’iche communities continue to live in dire conditions, while the vast majority of the perpetrators of these crimes enjoy total impunity. The US has also implemented economic and trade policies which reduce economic opportunities in Guatemala, such as the Central American Free Trade Agreement, thus forcing yet more Guatemalans to flee poverty and seek work in the US in order to provide for their families. GHRC/USA supports the demands of former Kyler Seafoods employees for severance and vacation pay, and applauds their efforts, supported by the Worker’s Community Center, to demand that the company treat all workers with respect.